1st Card – Past: Page of Discs…Self-protective could have been hurt in the past. Vain. Searching for a deeper sense of self. Remember to what degree the card mirrors myself. Starter Interpretation: A quiet, thoughtful person who reveals themselves as unexpectedly earthy, witty, and perceptive. May have been badly hurt in the past and tends to ward off superficial contact. Financial issues may be an abiding concern. Humanist. 2nd Card – Present: XIII Death (Reversed)… Transformation. Usually, about change, the death of a situation rather than physical death. Face our deepest fears about disintegration, loss, loneliness, rejection, homelessness, rejection, disfigurement, illness. By allowing the images to surface, and then letting the fears flow through and around us, we transmute them into energy. If we deny them, our souls wither. If we move towards death with love and acceptance, our world is transformed. Starter Interpretation, Reversed: Preoccupation with death of something. Enforced removal of old, outdated ways. Stagnation. Rigidity of mind. 3rd Card – Future: Six of Swords…A ferryman rows a boat towards a narrow straight, the entrance marked by six of swords. In prow of boat are two passengers, possibly mother and child [Yes!]. The adult inclines her head solicitously towards the child who is staring into the water as it slips by…the worst is over. You might feel a sense of hopeful anticipation in response to the dawn[Smiling]…concern over health or bereavement [Yes. A tragic death in the family]. Starter Interpretation: Travel that allows a release from cares and worries [I will be visiting him and his wife soon]. While challenges still lie ahead of you, the main difficulties have been overcome. The ability to give care to yourself and the vulnerable areas of your psyche. The beginning of something unknown. The Philosopher’s Stone…The alchemical egg can be seen as creative inspiration; the idea that comes to you in a dream [certainly in JT’s! ]…the gift of life, love, and inner vision. 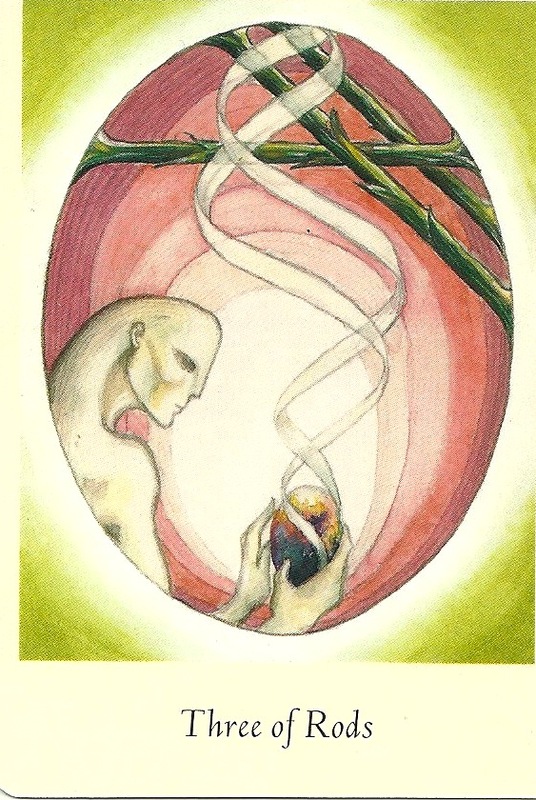 Forged from both sorrow and joy, it can offer you a doorway to the universe [This double helix orb seems to be an Archetype across all levels of life – physical, mental, emotional, and spiritual]. Starter Interpretation: This is the card of the artist, writer, inventor, dreamer, scientist, or visionary. Inspired gifts that need expression. Creative possibilities coming up. Connecting to the different dimensions of existence. A gift, freely given. Talent. Note: The cards say it all! I resonate to each one in the reading and see in each a portal to healing the relationship with my beloved son. I especially find the overall reading card, Three of Rods, as symbolic of what we have to offer each other and why we chose to walk this path together in this life: gift of life, love, and inner vision…forged from both sorrow and joy.